PHOTO BY JACOB GURNEY Law enforcement personnel investigate an accident Sunday afternoon. 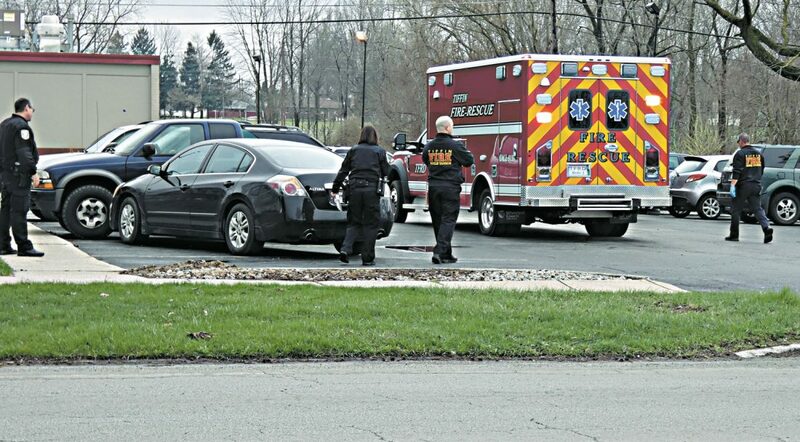 Two people were injured in an accident at Denny’s, 315 W. Market St., Sunday afternoon. Officer Molly Coleman of Tiffin Police Department said Jeane Taylor, 62, of Republic, was traveling east on West Market Street in a 2011 Nissan Altima with Thomas Taylor, 68, of Republic. Jeane Taylor had a medical issue while driving, lost control of the vehicle, and then her Nissan struck an unoccupied 2003 Chevrolet S-10 that was parked in the Denny’s parking lot, she said. Coleman said when the collision happened, Michael Haney, 52, of Tiffin, was standing by the truck, checking under its hood. When the truck was struck, Haney was knocked down, she said. Coleman said Jeane Taylor and Michael Haney were transported by Tiffin Fire Rescue Division to Mercy Health – Tiffin Hospital to be treated for non-life-threatening injuries. Jeane Taylor and Thomas Taylor were wearing their seatbelts, she said. A citation was not issued, Coleman said. The accident was reported at 2:31 p.m. and Tiffin Fire Rescue Division, Tiffin Police Department and John’s Welding & Towing responded to the scene.